1 William Penn, one of the best known Quakers in England, decided that his followers needed a new place to worship in peace. So he asked King Charles II to repay a debt owed to his family by granting him land in America. In 1681, King Charles agreed to the deal, and he named the new colony "Pennsylvania" or Penn's Woods for the Penn family. 2 Pennsylvania would become a very carefully planned colony. Penn wanted this new land to be a "holy experiment," which meant that he would give the people the opportunity to live in love and harmony according to Quaker beliefs. He also decided that if they could live in peace and harmony then this colony should also allow non-Quakers to live here as well. So he advertised Pennsylvania to Quakers and non-Quakers alike in England, Wales, Germany, Scotland, the Netherlands, and Switzerland. Many people then bought land from Penn. 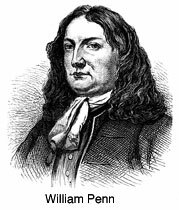 While Penn himself was not able to travel to Pennsylvania until 1682, he did send his cousin William Markham to act as his deputy governor. It was Markham's job to convince the old colonists, the Swedes, Finns, Dutch, and English, that they, too, would be governed by laws of their own making and that everyone in Pennsylvania would live as free people.